Best Drugstore Foundations for Dry Skin in India: The Best of All! Dry skin and a perfect foundation can seem a nightmare for many! A foundation can break or make your makeup look so it’s important to choose a right foundation for your skin type, specially for dry skin as most foundations tends to stick to dry patches and makes the face look cakey/patchy but with a right choice of foundation, dry skin can sure find a perfect foundation. 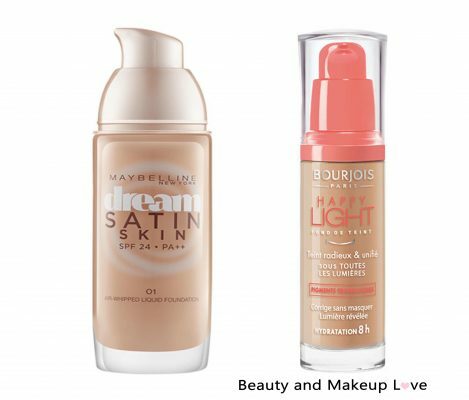 So today, we’ve compiled a list of the Best Drugstore Foundations for Dry Skin that are available in India! 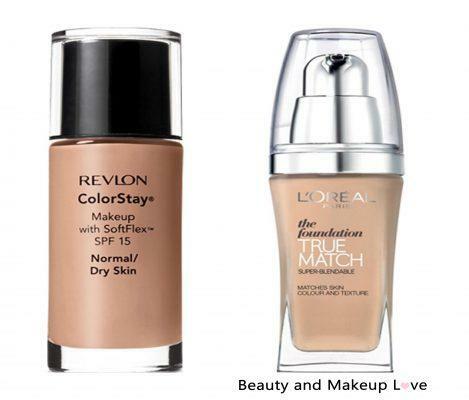 Revlon Colorstay foundation same as its counterpart (which is for oily/combination skin) is one of the best foundations for dry skin and we couldn’t thank Revlon enough for bringing it out in two variants – one for dry skin and one for oily skin! This foundation gives medium to full coverage, blends flawlessly (as how dry skin would want its foundation to blend on it) and sets to a semi-matte finish (nothing that would make you look cakey or patchy) and the good thing about it is that it photographs beautifully so if you are looking for something to wear to weddings or to parties where you’d be clicked with a flash on, this foundation could be your best companion in all drugstore options. Full coverage – photographs beautifully – 8+ hours wear time – flawless finish – no cakey or patchy look (what more could you ask for in a foundation?)! With all its pros, the only thing it lags behind for is the shade range available in India, with just 3 shades available – not everyone would find their perfect match and that is why it’s one of the best unsung heroes in drugstore foundations! L’oreal true match is one of those best drugstore foundations which I’m hooked to for life, no matter how many foundations I try (high-end or drugstore), I keep coming back to it again and again. It goes smooth on skin, doesn’t get cakey or patchy no matter how much you layer it, sets to a demi-matte finish and gives medium to full coverage. The wear time is 8-9 hours and the good thing is that it doesn’t feel heavy or like you have loaded yourself with makeup even when you build it to full. If you find a good match in it for your skin tone (which I think you could since it comes in 18 shades *which is amazing*), it almost looks like a second skin! This foundation wins up the race of Best Drugstore Foundations with an amazing shade range, coverage, finish, wear time and the (most) amazing formula *for me! Reviewed Here >> L’Oreal True Match Foundation! The dream satin range as the name says (satin) is perfect for dry to normal skin. It blends beautifully without clinging to the dry areas of the face and sets to a satin finish, for some it could be dewy and for some – semi-matte! If you don’t like the dewy finish, you can top if off with a powder and it will be semi-matte. The coverage of this foundation is light to medium and it’s got SPF 24 & PA++ which makes it a perfect daily wear foundation. It lasts for about 3 to 4 hours, more if you got full makeup on (primer, setting spray) which makes it good for in-house wear, when you are in the city and you just have to go out for few hours! There are 6 shades in the range which covers both pink and yellow undertones (if you are not sure about your undertone, you could check this Link to find your undertone) so you can probably find your shade in this! For full review, read here >> Maybelline Dream Satin Range! Although Bourjois pulled out of India (yes, it did *sob*! 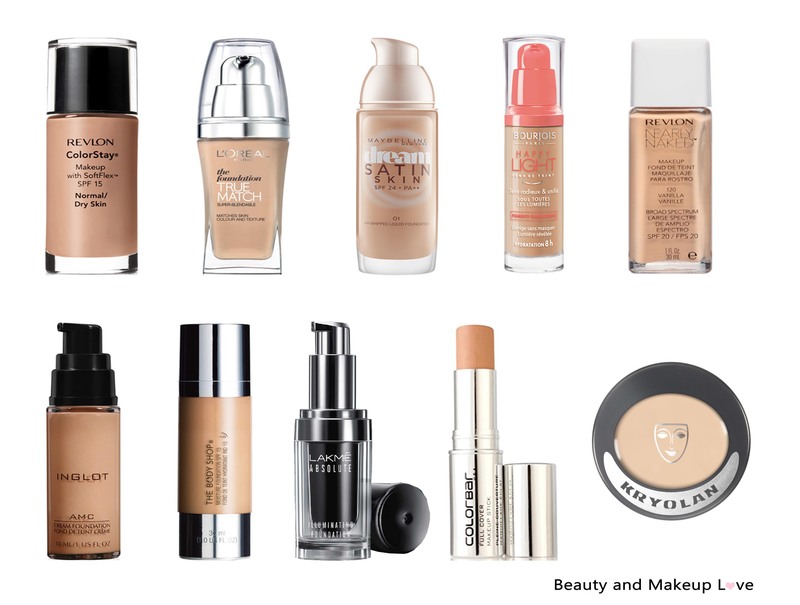 ), we could not miss including this amazing foundation in the list of Best Drugstore Foundations for Dry Skin. A secret for you all, you can find it on Lookfantastic.in (thank me later!). A cult favorite among all beauty gurus – this foundation without having to say blends like a dream, provides light to medium coverage, can be layered as many times as you want and it won’t get cakey at all. The texture of this foundation is neither runny nor thick. Happy light foundation is definitely better than Healthy Mix Foundation which is also said to be good for dry skin but unfortunately it’s not! Happy Light foundation has a dewy finish and has a wear time of about 8-9 hours. It keeps skin hydrated throughout the day as it claims of 8 hour hydration so dry skinned beauties will absolutely love the effect of this foundation. Also Read: Best Drugstore Foundation for Oily Skin in India! By the term ‘Naked’, you would have probably guessed that it’s a sheer coverage foundation – sheer but definitely buildable to a lil more! This foundation is super light, easily blendable – gives a light to slightly buildable coverage. The finish is dewy – so if you are someone who needs a little pick-me-up kinda makeup and have got dry skin, this foundation could be your right choice! Though the shade range is limited with just 3 shades available but if you find your match in it – this could be your best everyday go-to foundation specially in winters when skin tends to get dry and patchy. Without having to say, this foundation would work best on skin that does not have any skin concern and someone who wants a light-weight, light coverage foundation for daily wear. However, a little concealer and a pressed powder would make it look perfect! This foundation by Inglot has a thin consistency and spreads easily on to the skin. It provides light to medium coverage and though it’s not much raved about, it’s a cult favorite of many with dry skin. The way it blends – sets to a dewy finish – fills in lines & pores and doesn’t cling to any dry areas is what makes it one of the Best Foundations for Dry Skin. It gives an airbrushed and picture perfect finish. The illuminators in the foundation will get you that J-Lo Glow -if you are a fan of dewy, glowy skin (and of J-Lo’s glow ?) – this is what you need! The Inglot YSM Cream foundation (Note: I’m talking about the YSM foundation here) is also one of the best foundations for dry skin I have tried till date even though it claims to be for oily to combination skin but I feel it works best on dry skin! Could be that Kryolan foundation wouldn’t make it to the list of Best Drugstore foundations (? ), nope, certainly not! 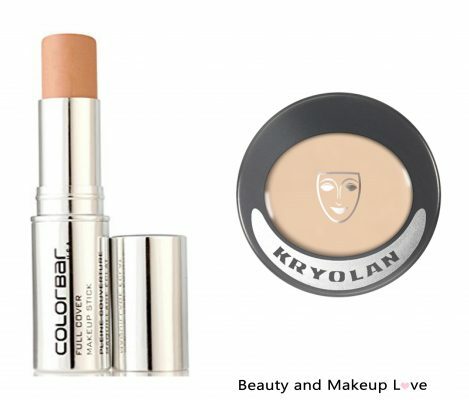 This foundation from Kryolan is a full coverage foundation which hides all the flaws and blemishes pretty well. It’s got a thick creamy texture but blends and melts well on (well moisturized) face – it gives a dewy finish and is one of the best foundations for dry skin. Perfect for events – parties when you need something that stays for up to 8-9 hours and gives a full coverage look! This also comes in a refill size which makes it easier and more affordable to do a trial to see how it fares on one’s skin before having to spend huge bucks on the full size! This full coverage foundation from Colorbar comes in a stick form and is very easy to apply. It’s a cream foundation which makes it perfect for dry skin. It goes on smoothly on skin but needs to be blended quickly – the trick with cream foundations is to apply the foundation on a small area and blend it first, this way it’s easier to blend. The foundation gives medium to full coverage and covers every tiny bit of blemishes and spots, can be used as a concealer too over some other foundation. Colorbar makeup stick is available in 3 shades which covers light, light-medium and dark skin, there’s no shade for very pale skin. Also Read: Basic Foundation Guide: Types of Foundation! The Body Shop Moisture foundation is an unsung hero but we make sure we bring out all the unsung heroes in front of you that could make their way to our Best ever or Top 10 list! This foundation has a medium consistency and glides smoothly on to the skin (as this is what is the biggest concern of dry skinned beauties), it doesn’t cling to the dry areas nor makes the skin look cakey or patchy. The coverage is sheer (almost like a tinted moisture) so it’s a perfect option for college goers or for daily wear as it’s got SPF 15 and is super light to wear on a daily basis. The finish is not completely dewy – it’s semi-matte, a little bit of concealer on top and a setting powder and you are good to go! 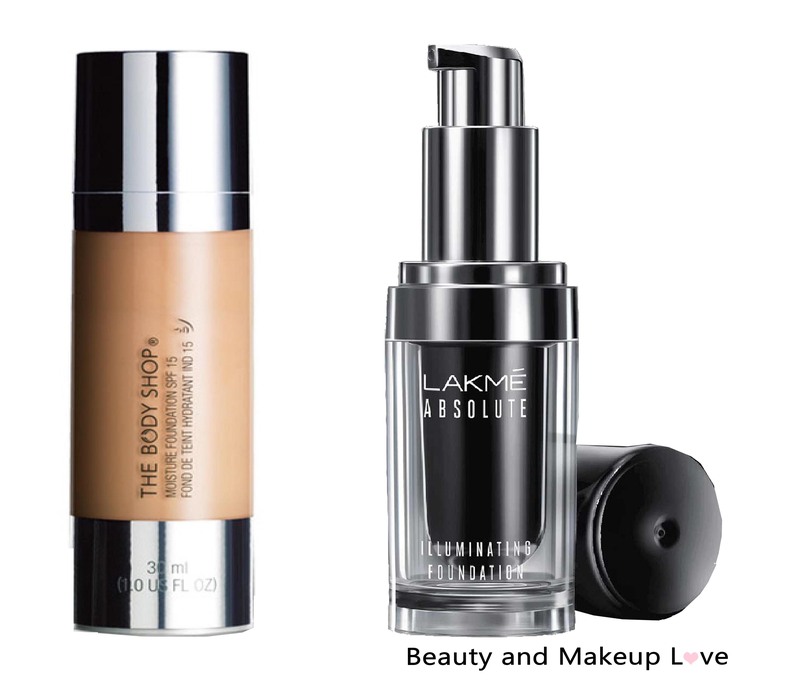 Out of all Lakme foundations, Lakme has ever launched, we couldn’t get a better option than this illuminating foundation to make it to the list of Best Drugstore Foundations. Reason? This foundation gives a light to medium coverage, gives that perfect dewy glowy (illuminating) finish and lasts for about 5-6 hours. This foundation is perfect for the upcoming festive season, if you’ve always wanted that shiny glowy skin which feels like there is highlighter all over (but it’s not), this illuminating foundation can do it for you! 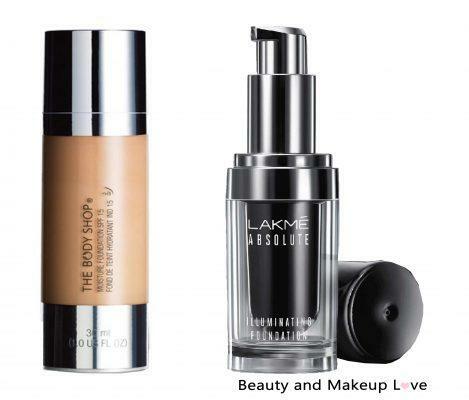 There are four shades available in this foundation, not a great variety of shades to choose from but Lakme never comes up with more than 4-5 shades in their foundation so we can’t really complain but all the shades suits Indian skin tone perfectly. These are our top 10 picks for best drugstore foundations for dry skin and we hope you’ve got some good options to choose from! 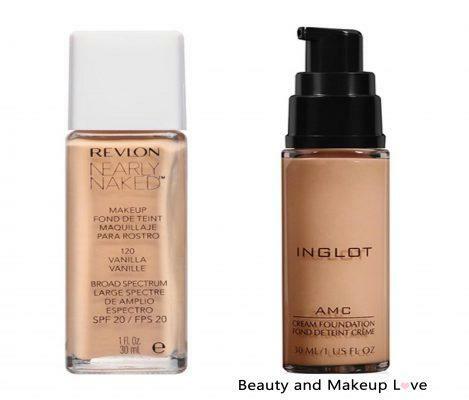 Which is the best foundation suited for medium yellow toned dry skin. Maybelline dream satin and LOreal true match are good options for dry skin and so is Revlon naked foundation! I’m from India, my skin is very dry, I have Dark Circles, and my face looks very dull, I have not a glowing skin and I’m working women also, so please suggest which is the best foundation for too much dry skin. Next Next post: Best Facial Oils for All Skin Types in India!